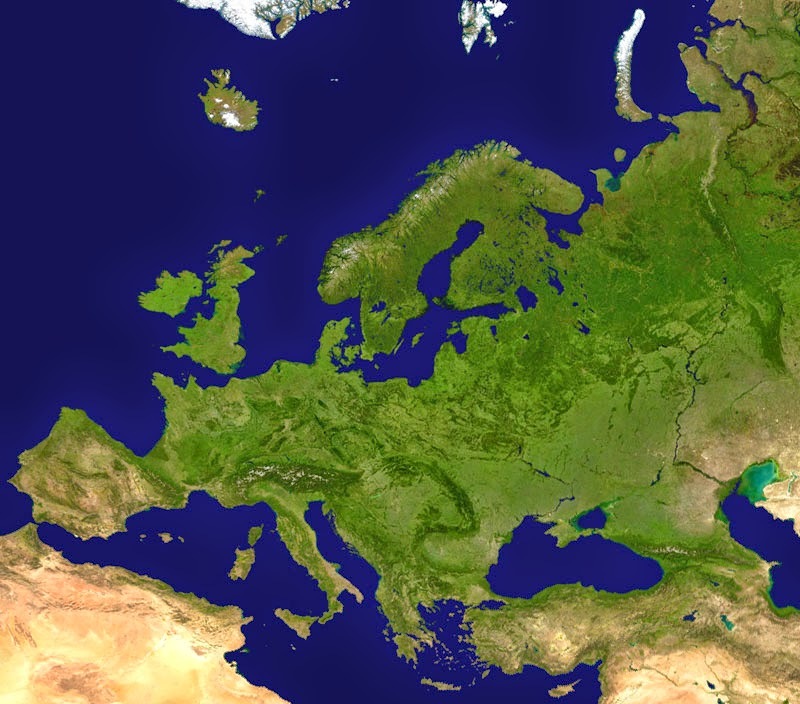 Beautiful Europe, as seen from Space. Today we're celebrating "Europe Day", a celebration of peace and unity in Europe. The EU celebrates Europe Day today, on 9 May, as opposed to the Council of Europe, which celebrated it on Monday, 5 May, coinciding with their establishment in 1949. 9 May is celebrated by the EU as it was the day that the Schuman Declaration was proposed in 1950. The aim of the declaration was to propose a supranational community, which led to the formation of the European Coal and Steel Community and eventually the European Union (EU). Instead of a history lesson on the EU, let's instead take a look at some of the languages in Europe... this is a language blog, after all. Rather than discuss the main languages, which have all been covered in their respective language profiles, we thought we'd take a look at the "genesis" of language in Europe, travelling right to the roots of Europe's language tree, where we find Indo-European languages. So the "European" from Indo-European refers to Europe, but what about "Indo"? Indo actually refers to India and if India's included you know this is a big family of languages. However, linguists believe that there is a shared ancestry among the over 400 languages that are considered to be part of this heritage. Indo-European languages make up the majority of the world's languages, with 45% of the world's population speaking an Indo-European language. In fact, Indo-European languages make up 12 of the top 20 most-spoken languages in the world. With nearly half of the world speaking an Indo-European language and "European" being in the name, surely every language in Europe belongs to this language family, right? Wrong! Ignoring languages spoken in Europe due to current immigration trends, such as Chinese, for example, many of the "native" languages of Europe are not Indo-European. We've already seen that Basque is a language isolate with no strong evidence to support its relation to any other language in the world. While Basque is a well-known exception, there are also the Karvelian languages, which include Georgian and several related languages. There is also not a strong consensus on which family the North Caucasian languages belong to, or whether they are in their own family at all. There's also the Uralic languages, including Estonian, Finnish, and Hungarian, which all reside in Europe, though this language family is also contested. Turkic and Mongolic languages are also not Indo-European languages, and once you get to the Semitic languages of Cypriot Marionite Arabic and Maltese, spoken in Cyprus and Malta respectively, you begin to get a sense that Europe is not as linguistically homogeneous as you may think. The final Semitic language, Hebrew, has been spoken by Jewish communities throughout Europe for years, and nicely brings us to the end of the exceptions. So celebrate Europe with us today! Whether you love or loathe the EU, celebrate the beautiful linguistic diversity of this continent, then be ashamed of it tomorrow as you watch near-monolingual monstrosity that is Eurovision!! !